Yesterday the Department of Sanitation began to roll out organics recycling bins across Community Board 6. 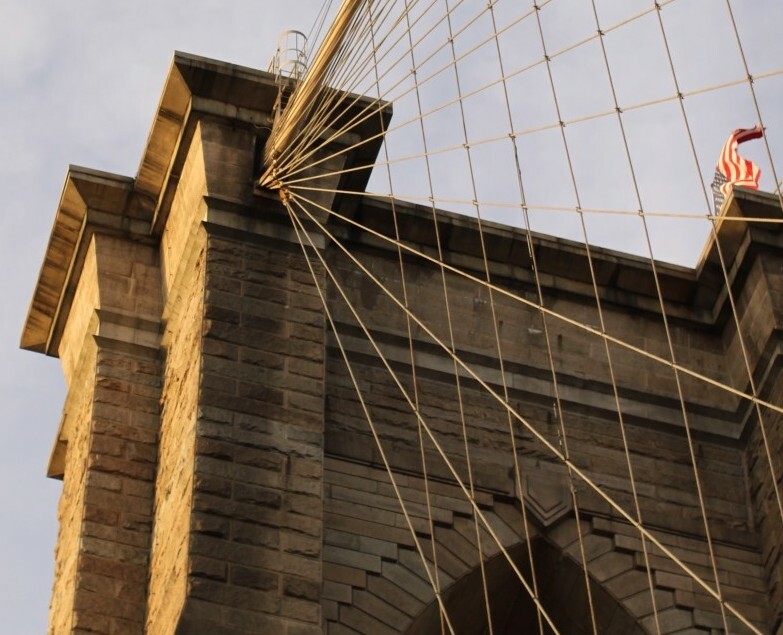 That’s Red Hook, Carroll Gardens, Cobble Hill, Gowanus, and Park Slope (although Park Slopers have already participated in the pilot program for awhile now). If you’re like me, you are late to the whole composting game. 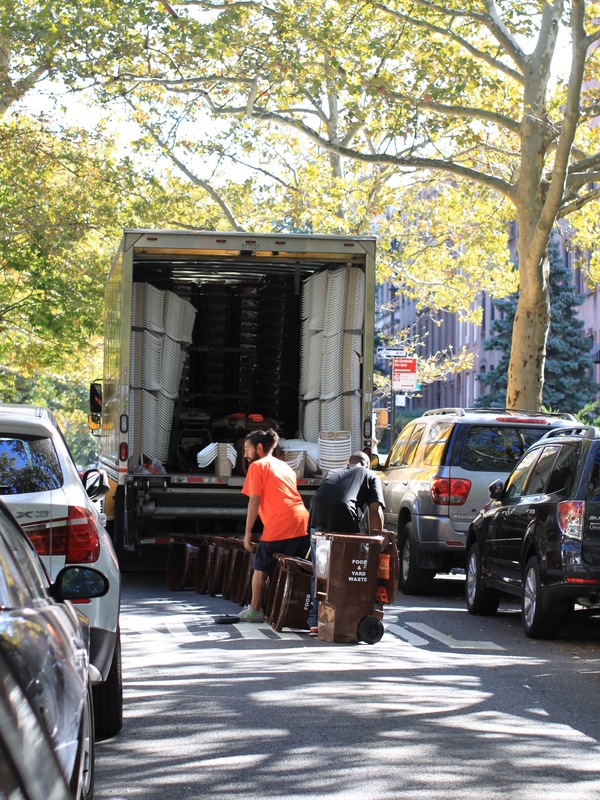 You knew they were coming but didn’t put much thought into the logistics. This week you probably came home to find the brown bins parked in your front gate. You opened it. You peered inside the brown monster and asked yourself, “Am I going to use the provided beige plastic bin and freeze my organics? Hell no! The freezer is where I keep my raw denim jeans.” So now what? As you read this you are probably stumbling through choices in the Amazon or Googling from your couchy perch for countertop compost bins. You may have also just realized that the bins are “frequently bought together” with replacement charcoal filters and compostable trash bags. After much soul searching, I made my selection. I deliberated for a whole 45 minutes because as you know, your choice of a compost bin says everything about you, now and forever. This is an outward expression of your inward obsessive. So you’d better make the right choice because your neighbors will judge you based on your compost bin. What I discovered about myself through this process is that my self-esteem is too low to go for the most expensive compost bin. I also can’t commit to something that’s high maintenance. I want something sleek and neat, but rugged, resourceful, and has a little fight in it. I mean I’m going to put leftover Kimchi in this thing. 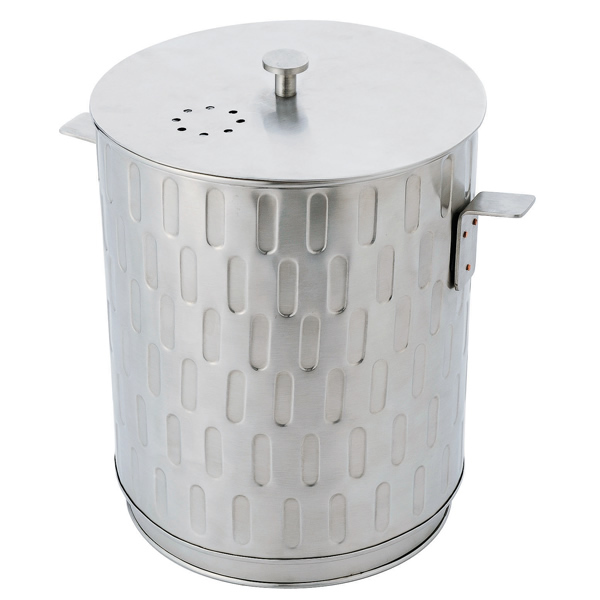 Consequently, I bought a working-class, sturdy, stainless-steel compost bin. It’s utilitarian. 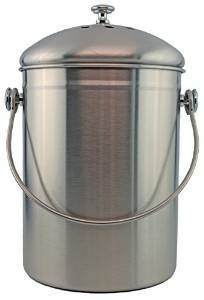 It’s the compost bin of the common people; the Magjo Stainless Steel 1 Gallon Compost Pail with Filter. I went stainless steel because my kitchen is already enough of a circus and if I get sick of looking at it, I won’t feel bad about hiding my relationship with it under the the sink or in a cabinet. However, there were a few statement compost pails I might Tinder one day. 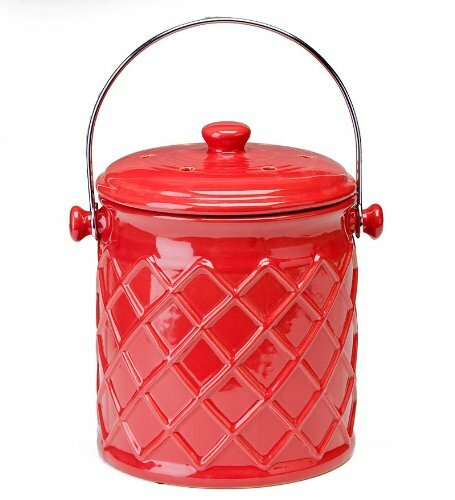 I considered the 1-Gallon Lattice Ceramic Compost Crock in red. If you love your Le Creuset and fantasize about chubby gingers cooking in clogs in your kitchen, this is the Compost Bin of your dreams. It will contain the odors of your left-over Linguine con Vongole and comes with 25 compostable bags and extra charcoal filters. But sometimes, I’m feeling a little… quirky. The colors in my kitchen are suddenly all so saturated and dimly lit. For some reason, I feel moody and I have a lot of thoughtfully placed but strange knick knacks. Decades ago a great uncle decorated this kitchen with mushroom wall paper and a taxidermy fox in the last throes of Rabies. 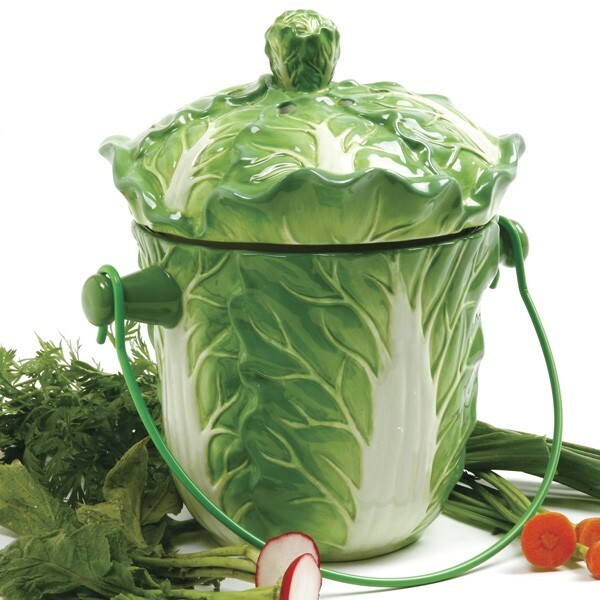 Jason Schwartzman is cooking me Welsh Rarebit in an ascot and the leftovers will go perfectly in the Norpro Ceramic Lettuce Compost Keeper. Ahh, but what about my aspirational compost bin? Yes, I mean the one I don’t have the self-esteem for yet; the Silver Kitchen Compost Pail w/ reusable liner. This is the “Mr. Big” of compost bins. You have to commit to this one. You have to introduce it to your friends. You have to keep it on the countertop and then you can’t goof off with the Magjo anymore. It’s referred to as “Silver” even though it’s made of stainless steel, just like all the rest. Size isn’t everything but the “Silver” does hold 4 whole gallons! Magjo only holds 1, but remember, you can hide it. At $73, the “Silver” better put a ring on your finger, take you out for Steak at Peter Luger and Lobster at Le Bernardin. Then when you sashay home with the doggie bag that you inevitably forget to refrigerate, it better disguise the smell thoroughly. Frankly Ladies, there just aren’t that many options out there for a New York composter. So whatever you choose, you’d better choose quickly! Tick Tock! Composting is upon us. Food is decomposing all around you as you waste time reading this. Always remember though. Your reputation is at stake, so choose wisely from your limited choices. Hilarious as usual, Tone! I love your style. I’m going to send you the link to my cheap compost bin which has served me well for two years and has never stunk up my kitchen! But it isn’t nearly as purdy as your Madjo! Thanks Em! Look forward to getting a look under the rim of your bin.